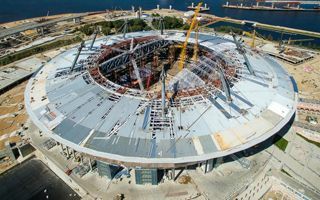 Main contractor of the Zenit Arena build, Transstroi, announced delivery of the permanent roof structure. Its steel skeleton was ready in June, now the entire dome is covered. The retractable segments are still being worked on, though. The giant “plate” now ready weighs 23,000 tons and spans across 71,000 square meters. It’s held in place by a combination of two systems. 8 tall pylons support it from above with cables, while four concrete pillars are built underneath. Beside the retractable roof works are also ongoing on the sliding field, seat installation and numerous other tasks. However, thanks to the delivery of entire permanent roof and all outer cladding construction should now go on regardless of adverse weather in autumn and winter. All works are expected to be done in May 2016. Contrary to previous announcements, it proved impossible to maintain a budget of RUB 34.9 billion. Current estimates put the total cost at RUB 38 billion, though after Russian currency collapsed that value is still very modest compared to its value when ruble was stable, nearly half the price in USD or EUR (at present $560m / €495m, respectively). Annual running cost of the 69,000-capacity stadium was also revealed. It’s expected to require RUB 300-600 million every year to maintain operation. Managing company is yet to be selected, but that decision should be announced nearly half a year before opening, in December.